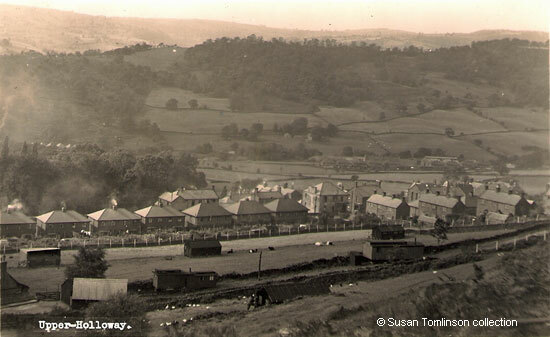 The card's caption is not quite correct as the view is of Church Street and Lea Bridge, with the hillside opposite belonging to Matlock parish (Bow Wood) - so not of Upper Holloway. In the distance is Cromford Hill and Black Rocks. The roof of Lea Mills can be seen far left, just over half way up the picture. The one thing that is hard to spot in the valley below is the cupola for Lea's smelting works. Look at the exact centre of the card, then go slightly to the right where there is a row of houses going towards the right. The cupola is just behind the houses. In the field closest to the camera are birds; whilst they could be chickens they are more likely to have been turkeys. There is then a footpath that ran from opposite the main entrance to Lea Hurst right up to Long Lane. Susan Tomlinson has commented that the locals always called this walk 'up Bob Yeomans' as at some stage the land was farmed by Bob Yeomans. There is then a narrow field with sheds in it, with another field beyond that where cows are lying down. About a third of the way up the photo is a row of seven semi-detached council houses. Behind the fifth house from the left used to be a Co-op Grocery shop, but this is no longer there and is thought to have burnt down. Holloway Co-operative Society was formed some time before 1861. At the right hand end of the council properties is a large square-looking house which housed more of the Co-op - the Drapery was on the right hand side of the ground floor. The left side was used by the Wirksworth branch of the Westminster Bank. A member of staff would visited Holloway once a week for any business, possibly on a Thursday. It is believed that the Reading Room that Florence Nightingale gave the village might have also been in the same building. The rest of the building was residential. Between this property and the next right is a short road called Little London, which is both steep and un-adopted. The next building was Limb's, a general grocery shop smelling of a mixture of bread and paraffin, etc., in the 1950s. It sold everything from paraffin, to sugar and sweets. There were lots of small drawers behind the counter. Chapels for the Wesleyan and Primitive Methodists were built in the village in 1854. On the left is one of many chapels built by John Smedley of Lea Mills and Riber; it can be seen behind the house and is on the right in the main image. May 28th, Thomas Greenhough, to Elizabeth England, by Mr Smedley, at his chapel, Holloway. Luke Hall to Susannah Radford, by Mr Smedley, at his chapel, Holloway. The houses on the right at right angles to the others are on what is called Hillside, at one time it was called The Square (there used to be another row of houses across the top). They were in blocks of three. Someone who lived there between 1910 and 1917 recalled that they had shared taps outside though later the taps were moved indoors. These houses were later demolished and replaced by council houses and bungalows for pensioners. "Upper Holloway". Published by District View Publishers Leicester. Although the card was posted in the 1950's, it was probably taken quite a bit earlier than that. Postcard in the collection of, provided by and © Susan Tomlinson. This account is based on information given by Susan Tomlinson. "Derbyshire Courier", 21 December 1861. The paper reported that the Lea and Holloway Co-operative Society had a quantity of grocery goods deposited at the Lea Mills Wharf, and some local boys had been seen opening the parcels and appropriating the goods. On this occasion it was resolved amicably as the boys apologised when the case went to the Petty Sessions. Post Office Directory of Derbyshire & Nottinghamshire, 1855. The Directory records that they were recently built, but later directories provide they year as 1854. "Derby Mercury", 6 June 1855.